1. 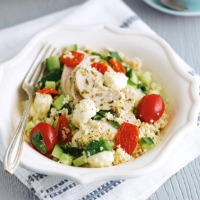 Place the couscous in a heatproof bowl and just cover with boiling water. Leave for 5 minutes or so, until the water has been absorbed, then fluff up with a fork. 2. Dice the cucumber and stir into the couscous. 3. Stir through the chicken, salad and lime juice, and serve.